The West End’s original and favourite 70’s musical is back on the road for over 50 gangbusting dates in 2013. It was 1997 when JON CONWAY and SHANE RICHIE conceived what was to become the first jukebox pop musical, way before ‘We Will Rock you’, ‘Mamma Mia’ and ‘Our House’ followed their lead. Indeed way before the dodgy movie of the same name, not to be confused with the film, this is the ultimate party show, with over 2,000 performances and a story set to the incidental music of our lives, for a certain generation! The hilarious and heartwarming story of Roddy O’Neil, set in a provincial British town in the height of the disco seventies, the decade that fashion forgot, became a massive hit show that ran five amazing UK tours after it’s London success, before then travelling to South Africa, New Zealand and America, where it is now a fixture on several cruise ships. Now, a remixed concert version sees the original characters in a packed hit-fest that promises 70 songs from the 70’s, that allows video images on a giant back drop to enhance an amazing array of LIVE MUSIC and ALL STAR CAST on the concert stage for ONE NIGHT ONLY. Following a remarkable sell out UK tour last year, THE OSMONDS will return from the USA as special guest stars, performing not just their own hits such as CRAZY HORSES and LOVE ME FOR A REASON, but also a range of classics they are not normally associated with. 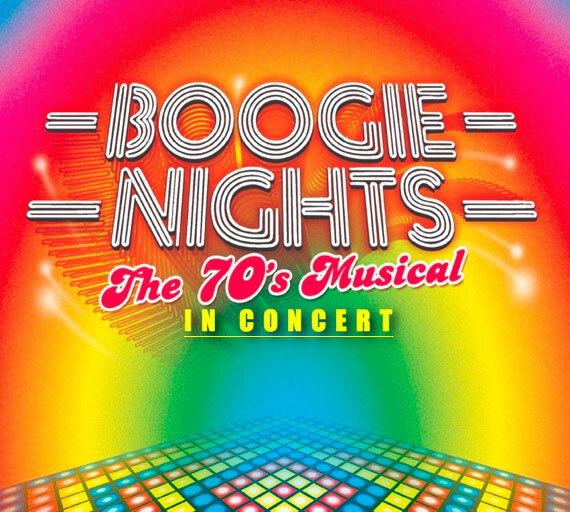 JIMMY OSMOND played the disco club manager in BOOGIE NIGHTS’S last UK tour and will be joined by his brothers MERRILL and JAY, direct from a season in Las Vegas. GARETH GATES will play the heart throb role of DEAN, delighting his many fans who have seen him in West End classics such as ‘Les Miserables’ and ‘Legally Blonde’, with a vocal range of pop classics covering his own SPIRIT IN THE SKY to IF YOU LEAVE ME NOW, DISCO INFERNO and a feature with THE OSMONDS including a cover of Donny’s PUPPY LOVE . The leading lady character of DEBS will be taken by LOUISA LYTTON who played the gorgeous ‘Ruby’ in ‘EastEnders’, then after a stint on THE BILL as ‘PC Beth Green,’ was featured on STRICTLY COME DANCING. This will be Louisa’s first musical and she can’t wait to belt out I WILL SURVIVE and DON’T GO BREAKING MY HEART. TV’s most popular talent reservoir X-FACTOR, provides more cast members as two of that show’s most enduring stars are added to the cast. ANDY ABRAHAM will play the tough guy soul singer SPENCER giving us Barry White classics such as YOU’RE MY FIRST, MY LAST, MY EVERYTHING and livewire CHICO, who was also a finalist on DANCING ON ICE 2012, will be the daft and engaging character of TERRY bringing his dance moves to such hits as LE FREAK. The star line up is completed by a theatrical first when SHANE RICHIE JUNIOR will take over the role created by his father as RODDY, the original seventies bad boy. It is the first time a role created by an actor has been inherited by his son and 22 year old SHANE JUNIOR will prove to be a real chip off the old block as he powers through hits such as BLAME IT ON THE BOOGIE. The concert will have a cast of 15 musicians, singers and dancers and promises a party atmosphere with some of the comedy sequences from the original show like Y.M.C.A. and HAPPY DAYS and the feel-good factor dancing in the aisles medleys WE ARE FAMILY and BOOGIE WONDERLAND.